As I mentioned in my review of the Karakuri Work Kit - Kakukaku Box, here's the second in the series of builds for the Karakuri DIY boxes. This time I'm looking at the Newton Box, which is a little more complicated that the first box in the series, and in my opinion a much better kit and puzzle! Read on to find out what I think of it, and see the video builds and review. The Video below is a short highlight reel for the build. I skip a lot of detail here, but it will give you the idea of how the build goes, and I have put my thoughts at the end of the video. If you want the detailed 50 minute video showing all the steps in detail, then jump to the Build Instructions section below. As promised in the video, you'll find the instructions below, with my guide to building the box. Be aware that this is in no way a translation of the instructions! 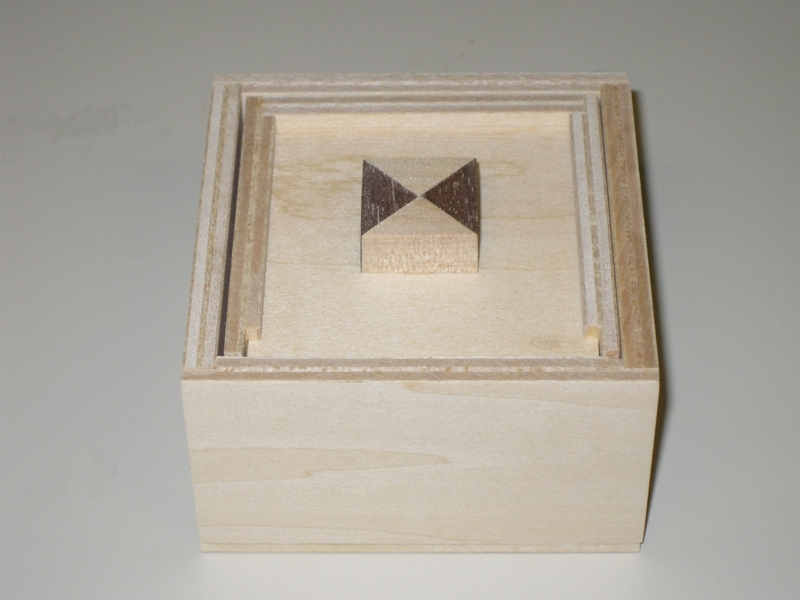 The Karakuri group offer a reasonable number of DIY puzzle boxes which they refer to as "Work Kits". Each of the kits consist of a number of pre-cut plywood pieces, some decorative pieces (like the beautifully made acorn on the Acorn Box), and any hardware needed for the mechanism, if it's not just a straight forward sliding panel or suchlike. The kits are all perfectly cut, and of the kits I own there have been no issues with the fit or finish on any of the pieces. Something which is worth noting about the kits is the price. They all come in at around the $25 USD mark, so in terms of affordability, these are really affordable boxes. The quality of the cuts on the pieces is excellent and the fit is as good as you will find with anything from the Karakuri group, so I'd say from that side of things, they're great value. One thing to note is that the build instructions for the kits are in Japanese language only. Don't be put off by that however as with a little thought, and some careful study of the diagrams, you'll build the kits just fine. Failing that, have a look at my Build Instructions section below, where I have detailed the steps (in English) to build the kit. On this particular kit, there were a number of the pieces which had small burrs or rough edges that I needed to clean up before starting the build. It's really not a big issue, and there were no pieces which were poorly made or had any sort of problem that would have meant that the kit did not go together easily. After all these are wooden kits, and each piece is unique. A little patience when starting to tidy things up and you should have no issues. This is the second of the boxes that I bought from the Karakuri Creation group, and as well as looking good, I was very interested to be able to see the mechanism, which you'd otherwise be unable to see. As you can see from the picture above, the box itself is fairly simple. The ply is visible on the top of the box, but personally I don't think that's an issue. If you don't like having the ply exposed, you could glue some veneer onto the top panel just to make it neater. The decorative handle is made from walnut and maple, and rather than giving you a pre-made piece, you have to put it together yourself, so it truly is a box you built. No pre-made fancy parts here! Building the kit was fairly simple. 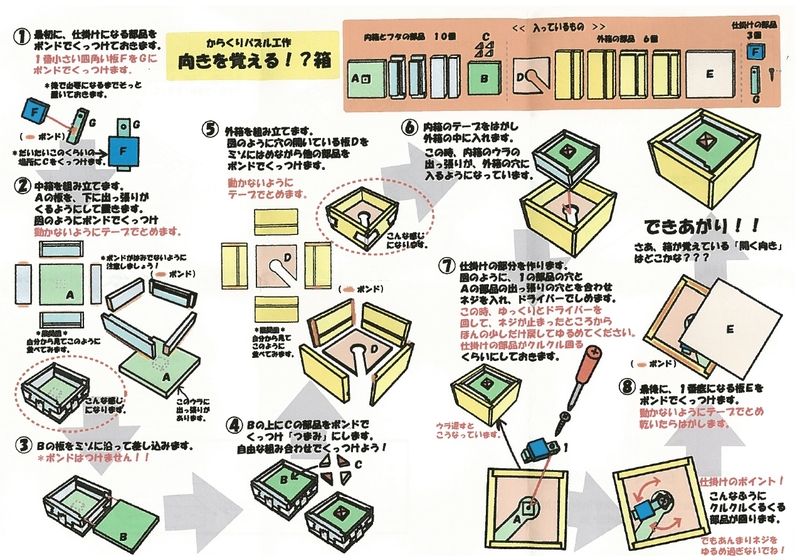 There is slightly more to this kit than the Kakukaku box, but the instructions make it easy to follow. The diagrams on the build instructions are very clear, and there's nothing complicated to this kit, so I didn't have any issues building it. The build of this box took around 30-40 minutes to put together, and would probably be quicker if you're not recording a video and talking through everything you're doing! I have to confess I really like this kit. 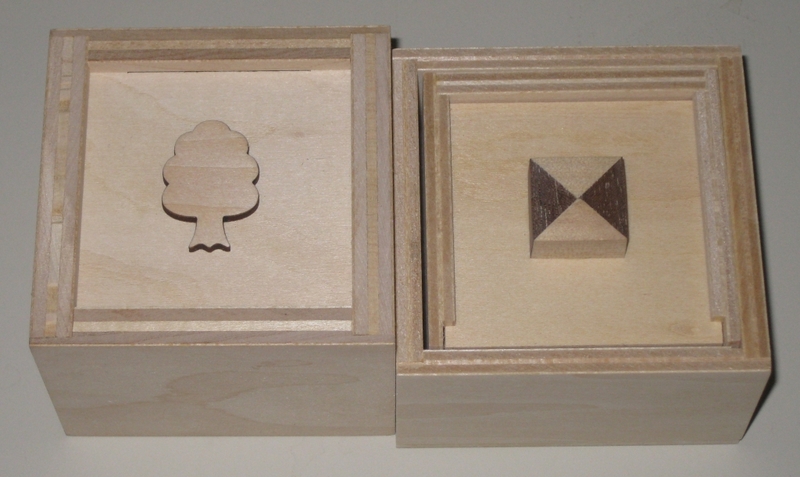 The puzzle box is much better than the Kakukaku Box and works perfectly every time. It's a clever mechanism, but remarkably simple which I like. The box look great, and I think the cube on top really sets it off. The box is slightly deeper than the Kakukaku box, and a little shorter. In total it measures 3.25" x 3.25" x 2" and is a good size in your hands. The image above will give you an idea of the relative sizes of the two kits so far. In this section I will try to give my guide to building this kit. Please note that this is in no way a translation of the Karakuri Group's instructions, but my own instructions based on having built the kit. If you have issues following my instructions, feel free to get in touch and I'll help you if I can, and update things below to clear up any confusion. The video below is a full 50 minute uncut build of the box. I show detailed instructions on how to build it, along with tips from my own build experience. If you're new to this and want some really detailed help, this is the video for you. Click on the image below for a full size version of the instructions. The instructions below match to the numbers on the diagram above. Before starting, you'll need a couple of tools. First up, sort the parts from the kit into the same order as shown in the top diagram. If you feel like you need to then you can mark the piece numbers in pencil on the inside of each piece. The way the pieces are laid out in the diagram shows the inside, with the exception of piece 'B', which will be inside the box and unlikely to be seen so even if you don't remove the pencil mark, probably not an issue. In my opinion, the pieces are pretty clear so you should need to label them. Take piece F and mark a centre line in the middle of the piece. Take piece G and mark a centre line down the length of the piece. Glue piece F onto piece G, using the centre lines as a guide. As the diagram shows, place piece F towards the bottom of piece G, making sure that the pre-drilled hole is at the top of the assembly, and is not obstructed by piece F.
Leave the top for around 10 minutes for the glue to dry (note if the glue you are using takes longer to dry, then follow the manufacturers recommendations). Taking the pieces labelled 'A' in the diagram, glue the four walls which will make up the sides of the inner box together, making sure that the groove which is cut in two of the pieces is at the top, and the thinner of the two pieces is glued to the bottom such that the groove will allow the piece labelled 'B' to slide in and out freely. Glue the four walls to the base labelled 'A' ensuring that the small pre-drilled cube which is glued to the centre of this piece is underneath (not inside the walls you are gluing to it). Make sure that the edges are square to one another and that they are lined up with the base section. Using tape, secure the corners of the box, and tape the walls to the base as shown int he diagram. Set this aside to dry. Make sure that piece 'B' slides freely into the groove in the inner box that you built in step 2. Using the four decorative pieces labelled 'C', glue them together into a square, then glue them to the centre of the piece labelled 'B'. Using the pieces labelled 'D' arrange the pieces as shown in the diagram. Apply glue to the pre-cut notches on two of the pieces, then insert the flat plate with the pre-cut hole into the narrow groove in the bottom of the pieces. Bring all four corners together ensuring that the flat plate sits in the groove, and tape the corners. Put this aside to dry. Step 6 - Putting the pieces together. Put the inner box from step 2 into the outer box from step 5. Note that the location of the cutout on the outer box will determine the orientation required to open the box. You can put this in any orientation that you want. Turn the assembly from step 6 over, and using the supplied screw and a Phillips head screwdriver, screw the pendulum assembly from step one into the pre-drilled hole. You do not want the screw too tight here. The pendulum should turn freely around the screw to ensure correct operation of the mechanism. Glue the large flat square labelled 'E' to the base of the box, hiding the locking mechanism. Using some tape, tape the base to the sides until dry. Congratulations, your box is complete! I agree with you: Newton box is my preferred kit available from Karakuri. It is certainly one of the more difficult to open. I also like the “Fake box”. It cannot be simpler but I use it to introduce puzzle box to non puzzlers and is a good way to talk about “lateral thinking”.